e.g. name of organisation, person. 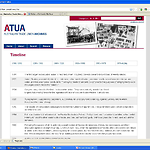 Australian Trade Union Archives (ATUA) is a gateway for researchers and scholars of labour history, linking together historical detail, archival resources, published material and information about Australian industrial organisations, mainly including trade unions and also employer bodies. 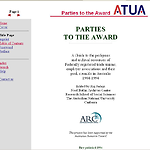 A Guide to the pedigrees and archival resources of Federally registered trade unions, employer associations and their peak councils in Australia 1904-1994. A timeline relating to labour history in Australia 1788-2001.